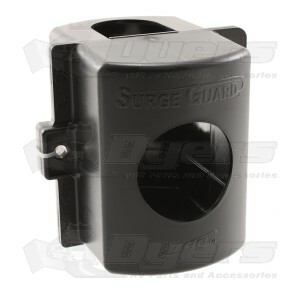 Use the surge lock hasp to prevent theft of your portable TRC surge guard. For use with both 30A and 50A portable surge guard units. Prevents unauthorized removal of your portable Surge Guard electrical protector from your RV. Easily attaches to standard 30 Amp and 50 Amp plugs. Great deal from Dyers buying the two together. Why not make it of metal? Cheap plastic. A screwdriver and 15 seconds and your surge guard is gone. No fuss, no muss and quietly. Very light material for something that is suppose to deter a thief. Not sure its worth the money. Service from Dyers however was outstanding.